Because that was the most affordable (4 voice) polyphonic MIDI enabled synth (I thought) I could get my hands on! I clearly remember passing by a local shop and seeing a mixer-like panel and instantly stopping to investigate it further. It was a 6 Channel mixer with a built in simple BBD echo and a 4 track tape recorder plus a stereo/2 track tape player. I ended up being able to finally get something! An i486DX2 with a SoundBlaster 16 (which I felt had more future than a Gravis Ultrasound). Got my hands on the smallest tracker I could download from my local BBS, the Composer 669 by Renaissance soon upgraded to Scream Tracker by Future Crew after trying FastTracker 2 and eventually settling with the MIDI capable Impulse Tracker by Jeffrey "Pulse" Lim. When connecting an hardware instrument to Reason, where it can work both as a MIDI Controller (sending notes, controls, etc to Reason) and also as a MIDI Instrument (receiving notes, CCs, etc from Reason) it's always good practice to turn off its Local Control. (unless you prefer to set the outgoing vs incoming to different MIDI Channels). Local Control? What is that ?! Well, usually, MIDI enabled instruments are able to disconnect their physical user-interface (keyboard/pads, knob/fader/buttons controls) from their sound "engine" or section(s). Why is Local Control needed? To avoid MIDI feedback loops or double triggering of notes, etc. You have the External MIDI Instrument (EMI) rack device point to Arturia DrumBrute's (in) MIDI port, so you can send MIDI notes from Reason and trigger DrumBrute's pads (sounds). 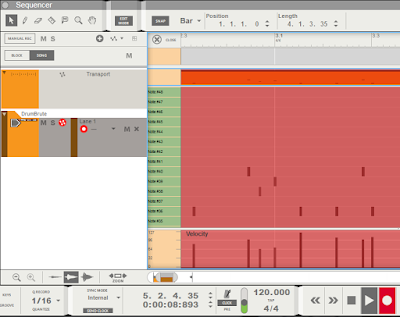 But you also want to receive notes from the DrumBrute's pads/sequencer so you can easily record your pad playing into Reason's own Sequencer tracks. To do that, you simply add a (generic) MIDI Controller Surface and point it to DrumBrute's (out) MIDI port. This is why is usually a good idea to set Local Control to OFF on external MIDI instruments connected in these configurations. The alternative to this, like I briefly mentioned in the beginning, would be to work on different MIDI channels but in this particular case, I find the use of Local Control, when available, to be a more practical solution. 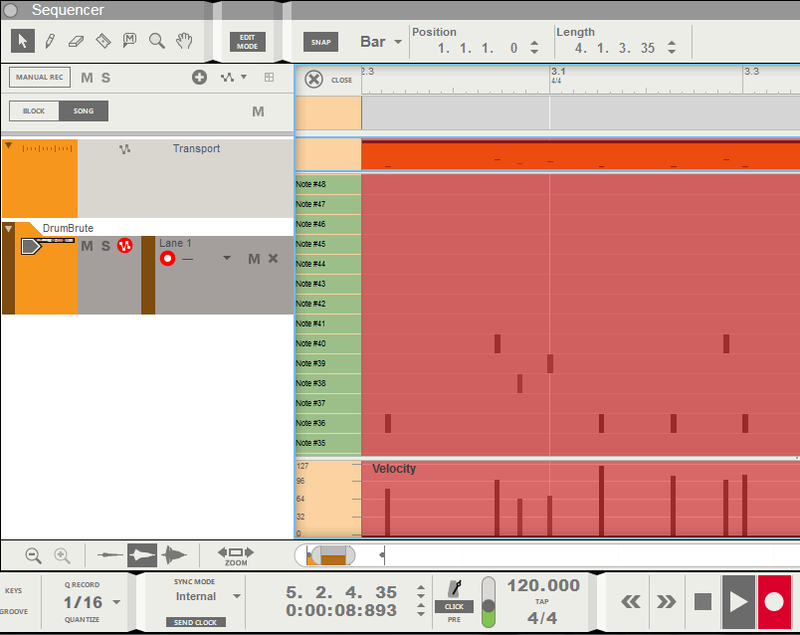 A specific Remote Codec that will turn its Local Control OFF while being used with Reason, allowing independent use of both its "controller" aspect and its sound generation aspect, without any local connection between the two, all controlled through Reason. "DrumBrute /<": it's a regular transparent one, just in case you prefer to use a dedicated Codec but don't want Local Control to be turned OFF. If you want this one, don't use auto-detection. You'll have to add it manually, by choosing "Add", "Arturia" and the "DrumBrute /<" model in the Edit, Preferences, Control Surfaces configuration of Reason. "DrumBrute /< (Local OFF)": this is the one that will be auto-detected and added by default and it's the one that will turn DrumBrute's Local Control OFF when starting Reason. Local Control will be restored to ON when you quit Reason. If for some reason you disconnected DrumBrute before quitting Reason (so Local Control ON couldn't be sent) simply connect the DrumBrute again to your computer, start Reason and quit Reason. That will allow Reason to send the "Local Control ON" again to DrumBrute and make the pads work again (locally, when not connected to Reason).